Beasley Forest Products, Inc. (Beasley Timber Management, LLC and Thompson Hardwoods, Inc.) are committed to continually achieve certification to the Forest Stewardship Council (FSC) Chain of Custody, Controlled Wood and Trademark Use Standards, as well as comply with applicable environmental, social and health and safety laws and regulations. Beasley Forest Products, Inc. is committed to implementing the Forest Stewardship Council (FSC) Controlled Wood Standard (FSC-STD-40-005) for its wood procurement and manufacturing operations. The company implements best efforts to avoid trading or sourcing wood or wood fiber that is: a) illegally harvested, b) harvested in violation of traditional and civil rights, c) harvested where global conservation priorities are threatened, d) harvested in forests subject to a significant rate of loss, e) from forests in which genetically modified trees are planted and f) inconsistent with the principles established by the International Labor Organization through the 1998 Declaration on Fundamental Principles and Rights at Work. Beasley Forest Products, Inc. is committed to sourcing wood material from certified sustainable sources. 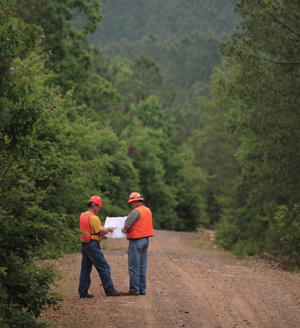 The organization employs scientifically, environmentally, socially and economically sustainable forestry practices to meet the needs of the present without compromising the ability of future generations to meet their needs. This is accomplished by practicing and promoting a land stewardship ethic that integrates reforestation, growing, and harvesting of trees for useful products with the conservation of soil, air and water quality, biological diversity, wildlife and aquatic habitat, recreation and aesthetics. To help implement and achieve the above Sustainable Forestry Standards, Beasley Forest Products, Inc. has developed and adopted appropriate programs, plans and procedures to guide its fiber procurement and labeling activities. The company is also committed to annually audit and review the effectiveness of its Policy and Programs to continually improve performance.